Buckingham Tourist Information Centre are now selling copies of Harvey and the Moon Bus. Buckingham University Bookshop are stocking Harvey and the Moon Bus, and invited me to do a reading of the book with them at Buckingham Primary School Nursery on the 21st January 2019. It was a lovely evening with blankets and cushions on the floor, children in their PJs and hot chocolate. 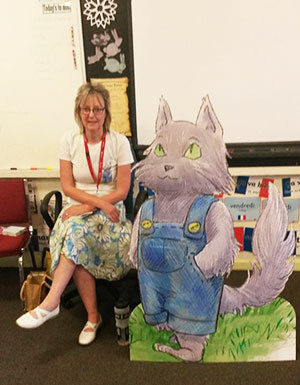 I was invited to do a Harvey and the Moon Bus reading and Q&A session at Marsh Gibbon primary school on the 6th July. It was a fun few hours reading a couple of Chapters of the book and answering the children’s questions. Coles Bookshop in Bicester now has copies of Harvey and the Moon Bus in stock and have put together a ‘local author’ book display. I invited friends and family to an evening celebration of the book at the bookshop on the 29th June 2018. The Book House bookshop in Thame are now stocking Harvey and the Moon Bus. I was invited to the bookshop to sign a few of the books. This is wonderful news as it was my childhood bookshop where I spent all my pocket money! 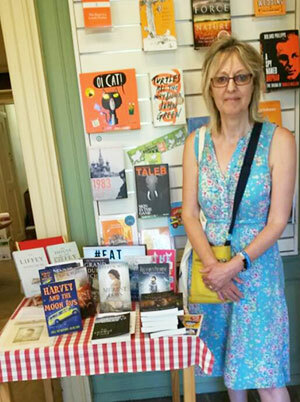 The Old Hall Bookshop in Brackley now has Harvey and the Moon Bus in stock, and I was invited to a ‘local authors’ day on the 22nd June 2018. It was an enjoyable few hours spent talking with customers and other local authors. Harvey and the Moon Bus was at the Buckingham Community Centre, Small Hall, Buckingham MK18 1RP on the 17th March 2018, 10am-4pm. It was a fun day with plenty of the books being signed and sold. Harvey and the Moon Bus returned to the venue on the 8th December 2018, and had a ‘guess the number of marbles’ in the old fashioned sweet jar. The winner was a young boy, also called Harvey, who won a Harvey and the Moon Bus t-shirt. Gartocharn Primary School in West Dunbartonshire, Scotland were delighted to receive a copy of Harvey and the Moon Bus. Buckingham Library were delighted to receive a copy of Harvey and the Moon Bus for their ‘Children’s Corner’. Snettisham Primary School in Norfolk were delighted to have received a copy of Harvey and the Moon Bus for their 5-7 year olds ‘Reading Corner’. The children will hopefully be reviewing the book and their comments added to our ‘collage’ pin board which we will be displaying at future events. Dersingham Library in Norfolk were delighted to have received a copy of Harvey and the Moon Bus for their ‘Story Corner’. They will also be reviewing it and providing feedback.